Talking to Franz von Holzhausen on the second press day while the model was in full swing, I asked whether the main volume had been modeled at the Mazda main studio. I already new that it had but wanted him to inject his take on this novel approach to car design. He said that the overall basic shape had been put in place purely because the amount of space needed to store the clay and amount of time needed to pack the buck before design could begin. He wanted the time allocated at the motor show purely for design development. This meant that the changes we would see at the motor show would be controlled and materials needed to capture these changes were at a minimum. A small clay oven and four or five boxes of Faber Clay Light, 3rd Generation would support any changes each day, keeping the modeling area relatively free from clutter. The measuring equipment to control the dimensional integrity of the model would be supported by two free standing portable Tokyo Boeki CMM machines with digital readouts. Any dimensions taken would have to be hand written co-ordinates to keep the sophistication to a minimum and manually spotted into the clay surface. These machines can be leveled to any environment and providing these machines are indexed off of a set co-ordinate on the model and are square to the front of the model or parallel to the center axis, data can be transferred from one side to the other, ensuring symmetry and dimensional accuracy. The initial design of the winning sketch created as a tape drawing ready for converting into a three dimentional model. This is where the dream starts to become a reality, an initial package drawing would help to ensure that people can actually be transported within the form. This is no science fiction vehicle, it has to be able to work in real time. The third scale model is used to explore a lot of ideas in a relatively short space of time whereas if it were a fullsize model those changes would take that much longer. 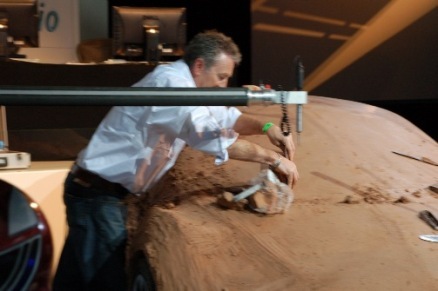 Considering the motor show runs for ten days the design has to be cemented at third scale level to enable the sculpting staff time to create the idea as a fullsize. Once the scale model is complete I would imagine that point data would have been pointed off the scale model, I say this because I can’t see how you would create the necessary information in the small enclosure that they have at the motor show without a fullsize tape drawing or first milling in the basic form . This picked data would be easily pointed in and the surface then refined to suit before new data can be picked via the touch probe head on one of the Tokyo Boeki machines. In essence what we will see as a finished article will be a fullsize clay model covered with dinoc film for the 3PM reveal on November 24th 2007. This will be by no means the end of the development, in fact it will show the general proportions of the scale model that can later be refined behind closed doors and probably changed considerably just to keep the public guessing at what is really to come, afterall this design is for 2018! The public gets to enjoy what really happens at these highly guarded advanced design studios, watching people like Dennis Baker, the sculptor in the image, as he plied his trade. Unless you are prepared to visit every day it is hard to gauge the amount of work required to meet this sort of time frame and especially under the watchful eyes of the public and the cameras. I for one thoroughly enjoyed speaking with former colleagues such as Dennis Baker and Franz von Holzhausen, I was impressed how Franz during his press conference expressed that this is how we develop our clay models using the experience of the modelers to bring the model to life. It is that understanding between modeler and designer that creates the best design possible in any giving time frame. In this case a time frame that is to say, a little tight!